We are delighted to be showing a series of new paintings by Charlotte Verity in the Design House at Roche Court. This exhibition is selected from the large-scale paintings Verity has made over the past three years and is her first show with the New Art Centre. It is also the first exhibition in our new gallery space to be devoted to painting. Charlotte Verity's paintings are, at first glance, beautiful, simple and elegant; on closer scrutiny, they are, however, far more complex. As Edmund de Waal suggests above, Verity's work captures a moment in time and this temporality is redolent of the wider world and the very fundaments of existence. Her subjects - the flowers, plants and fruit in her London garden - are painted slowly over weeks and months. Nature, of course, is in a constant state of flux. Light changes constantly, weather conditions shift, and the seasons pass; painting en plein air is certainly no picnic. And since time moves apace in nature, the moment Verity captures vanishes very quickly, so she may have to wait a full year for the right circumstances to return. It is a paradox then, that the fleeting moment Verity portrays is rendered permanently in her work. 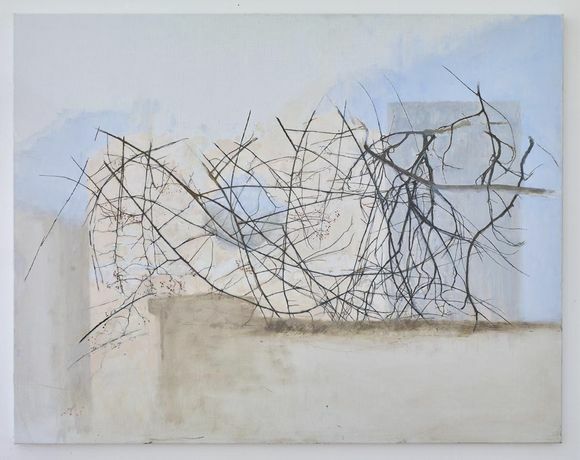 Verity describes how observation 'underlies every painting that I make' and in her compositions one starts to appreciate the small marvels to be found in nature: the curve of a stem, the colour of a flower, the formation of its petals, the matrix of branches and a mass of leaves. Paint is applied thinly in muted colours, and the sense of light and space left around the subject matter, are as important as the subjects themselves so that the viewer is compelled to look more closely. 'Looking and drawing, gazing and drawing - without prejudice' she says, 'is like seeing something for the first time with the urgency of a last and final glance.' Her close interrogation of the simplest things in these paintings, does indeed encourage us to take time, and to look again and again. Charlotte Verity (b. 1954) studied at the Slade School of Fine Art and lives and works in London. Her work is in major private and public collections, including: Arts Council England; Derby Museum and Art Gallery; Deutsche Bank; Garden Museum, London; Museum of Contemporary Art, San Diego; Sir John Soane's Museum, London; Tate and University College London. She has exhibited widely including most recently at the Garden Museum, London. Selected group shows include: Royal Academy Summer Exhibition, London; Drawing Biennial, The Drawing Room, London; Yale Center for British Art, Connecticut; Sir John Soane's Museum, London; Tate Modern, London; Whitechapel Art Gallery, London; and John Moores Exhibition 17 at the Walker Art Gallery, Liverpool.